When I was in the Bay Area, I noticed something very peculiar in a lot of the restaurants that I visited during my stay. Many of them are newly introducing (or rediscovering) innovations of the common protein of cooking, chicken. With the abundance of KFCs, Popeye’s and Church’s chicken in the premises it makes me wonder how under appreciated this protein is compared to the rest of the ingredients in the carnivore carnival. I was ecstatic to bring both my girlfriend and best friend to this spot, given it’s ages since I’ve come here to this part of town. As we arrived, we that it was a full house tonight and there were no canceled reservations so it made us wonder whether or not we would be able to enjoy our meal tonight. Suddenly a group of six came out of nowhere and were accommodated immediately. It was appalling at first considering we were there already for about 20 mins in advance (turns out they did a group reservation 3 days prior, clarified the wait staff). Despite the miscommunication, the experience was slowly turning into a nightmare and rearing its ugly head toward me. Finally we were seated 10 minutes afterwards in this awkward, corner of the room. I couldn’t see the yakitori grill station given that it was already occupied by many other patrons. Everything seemed comfy and cramped at the same time. Finally they set the menu in front of us and apologized to us when we come to find out some of their more popular items ran out: Kawa, Nankotsu and Hatsu (Chicken Skin, Chicken Cartilage and Chicken Heart). Setting our expectations we figured to brighten the mood with a bit more sushi in our lives (granted we already knew this wasn’t what they should be known for). The rice in all the nigiri pieces were consistent to their ratio and texture. While the cucumber. ginger and wasabi served as extras to the presentation. 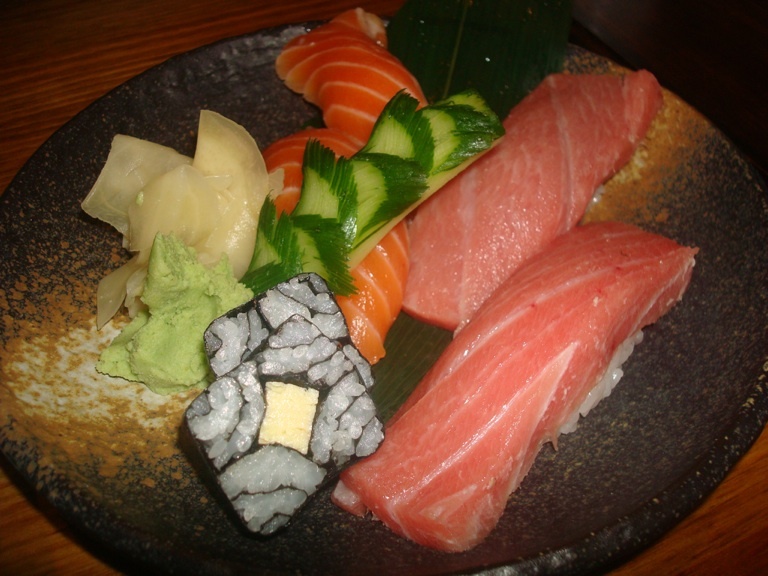 The Shikai Maki was a small teaser compared to its seafood counterparts all large and filling. Finally the Sake was the best of the trio, then came the Kanpachi and finally the Toro (which they claim was blue fin, but I tasted a bit of freezer burn and there wasn’t enough traces of fat to keep the fish from tasting anything buttery or rich. Next up the Pork Belly, a trio of skewers waiting to be judged. It looked pretty ordinary to me at first glance and I honesty thought they gave us pork belly by accident. Squeezing the lemon and giving it to the traditional splashes of acid we all sank into our first bites. We realized it wasn’t as tender as many other spots but the lemon does help soak a bit of flavor into it. Tonight was an unlucky night for us to really see if B-Dama can put their best foot forward. 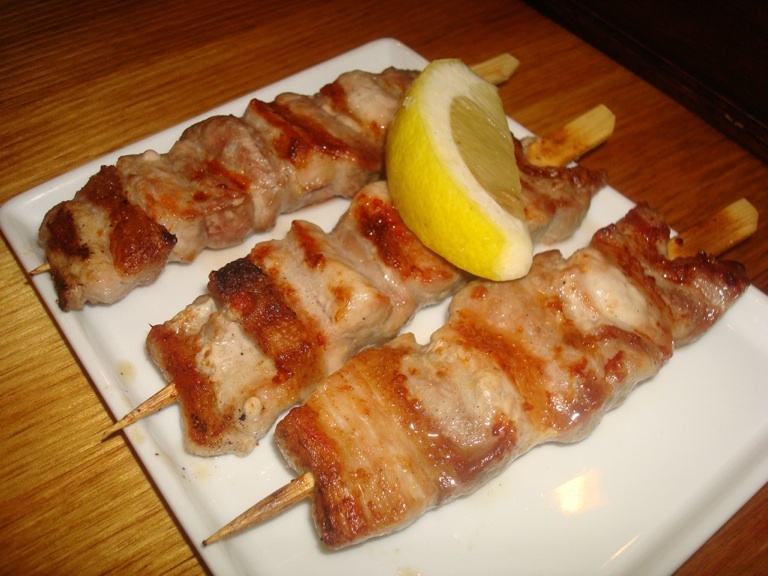 Out of nowhere the waiter was able to bring a skewer of Negima for us to share, at this point we really wondered whether or not it was worth the effort. Separating three individual pieces with the scallion left hanging we chewed our way through the bits of this mangled bird. Surprisingly it was moist and flavorful (with a bit of salty and tanginess) left on the tongue. 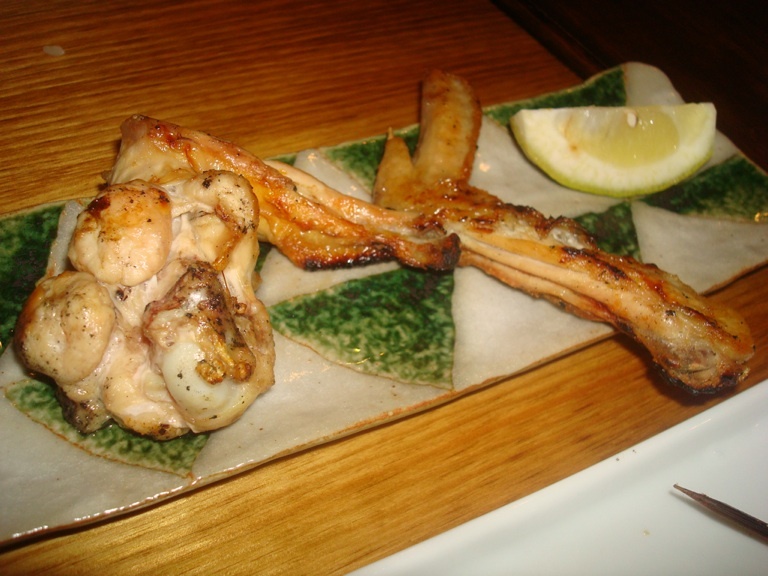 The momo (chicken thigh) was another part to the sawed up bird worth tasting. The pieces were a bit disproportionate from what I would imagine. Definitely chewing through the bird it was tender but definitely not as moist as the negima. 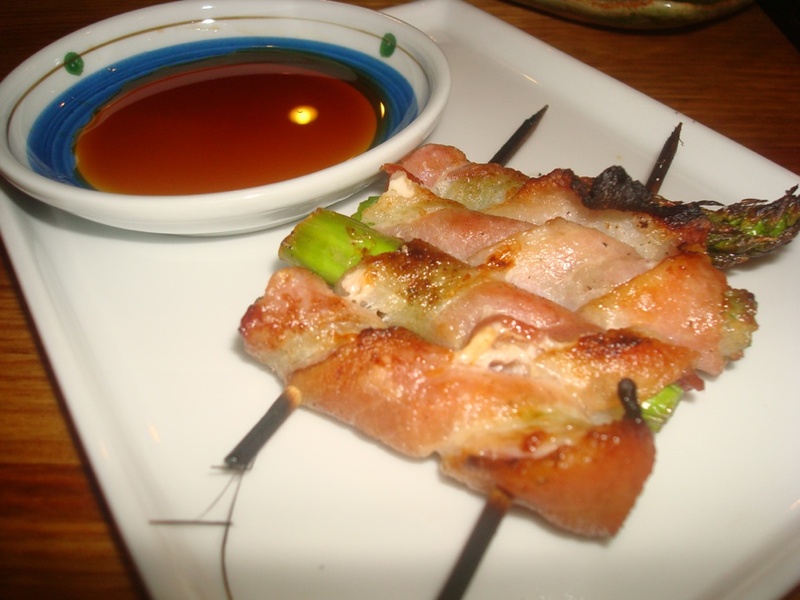 Bacon and Asparagus, a staple in many Japanese yakitori spots. It was somewhat dry, salty, and somewhat burnt on the initial tasting. 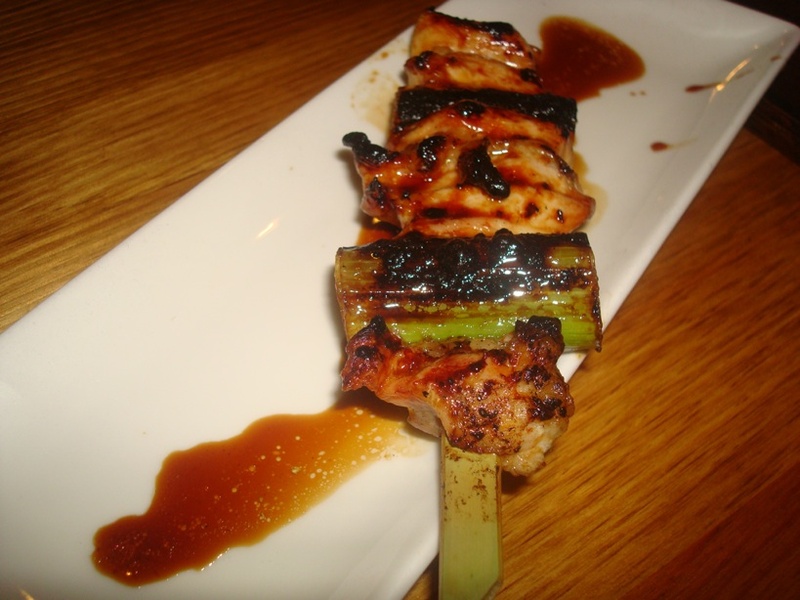 However dunk it in the yuzu sauce and it becomes a bit more tolerable (think citrus ashes, I know wishful thinking). 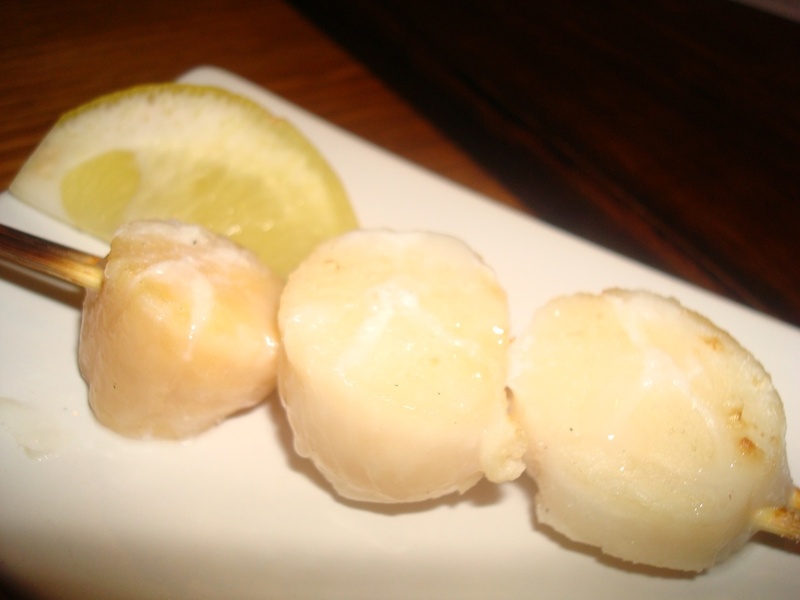 The scallops came out to the table and they were huge for skewer portions. My girlfriend found them to be a bit more chewy than usual but still enjoyable. As for myself, I wasn’t really feeling them. I prefer them to be caramelized in a more traditional French cooking style, but that’s just me. Kaki-age felt like it was a pity giveaway right from the start. Since our earlier complaints of the lack of supply of chicken, this should have been acceptable. 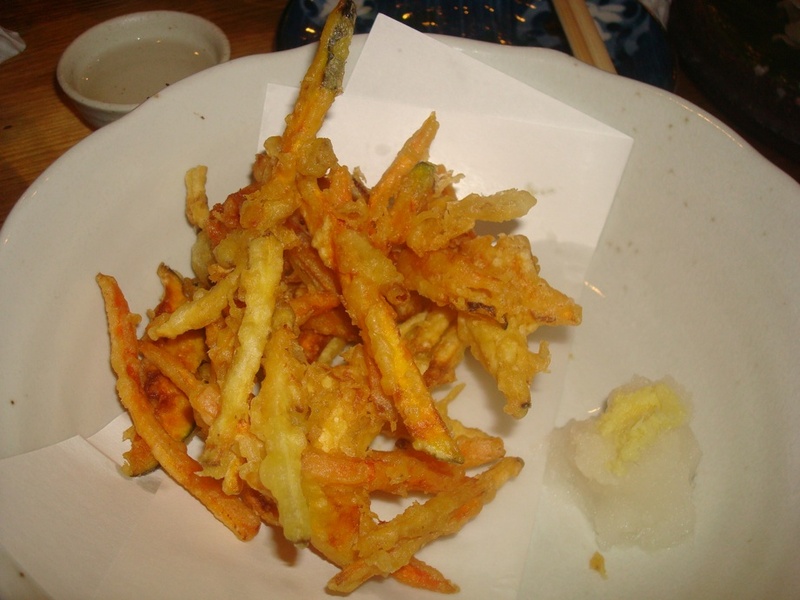 Sadly, the pile of lightly battered pieces of tempura were completely bland and the barely touched pile of daikon/ginger compost did not convince me to finish the rest of it. We felt kind of jaded at this point and figured to try the chicken liver since my girlfriend had a new found enjoyment with Foie Gras. Shortly after everyone had a bite of this thing, no one wanted any part of it. Tasting completely like doo doo (chicken doo doo) everyone’s face of disgust was unanimous. 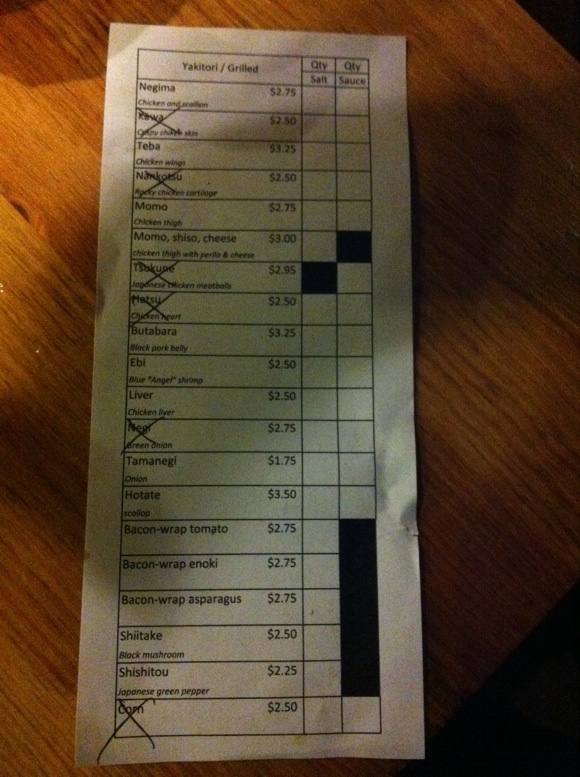 For our last dish, the shrimp was quite flavorful according to Jake and my girlfriend. 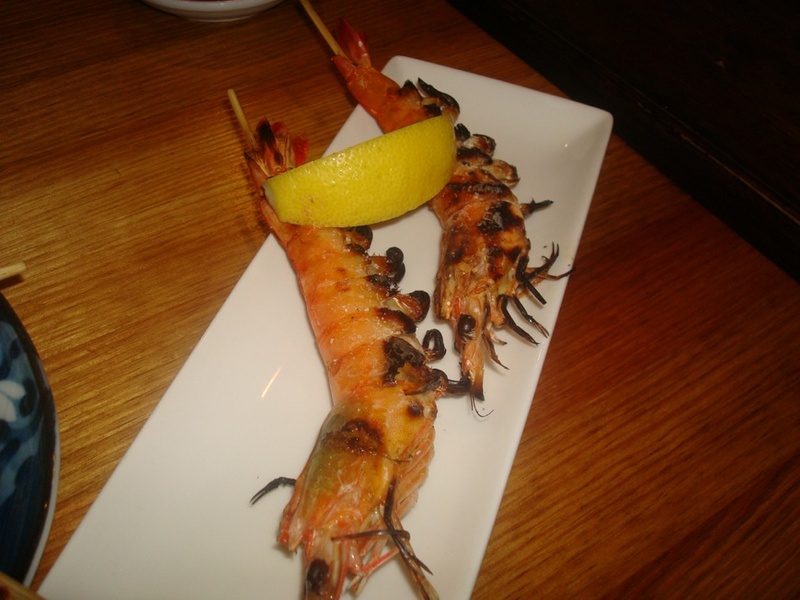 I believe the texture and flavor is standard compared to every other grilled shrimp I’ve had, so it wasn’t as spectacular as I would have hoped for. Overall, our jaded experience in lack of chicken made me wondered if this place was really worth the hype or trouble in visiting. Our waitress Akiko was very apologetic towards the end of our dinner and the damage was done. At this point, does it really matter if we end up trying this place again and giving it a second go-around? Will we ever understand the true nature of B-Dama? For something retro and under-appreciated over the years, would I ever join the masses in unison and finally try a Japanese Chicken worthwhile? I would like to hope so, until then that would have to be in the distant future. 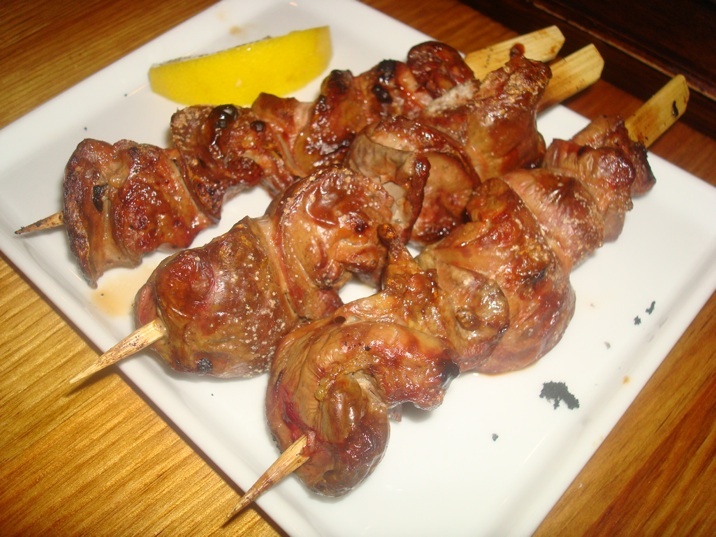 « Foodoofus Special Issue: The NorCal Chronicles #2; Reflect, Repent and Revisit. What’s with the crazy looking tamago roll? Hope you guys are enjoying yourselves up there!